When birders way out on the east end of Long Island reported breeding Least Bitterns at Arshamomaque Preserve in the town of Southold, my interest was momentarily piqued but I figured that I wouldn’t have time to go looking for them what with work and family obligations. But after my epic 22-hour workday last Wednesday I had a couple of days of time off as compensation for making myself a gibbering wreck so I used yesterday, Monday, 07 July, as a day of birding. I made Arshamomaque Preserve my first stop. Imagine my joy, however, as on my walk to the tower a Virginia Rail sauntered past almost within touching distance. I was pretty slow on the draw, unfortunately, but I did manage this horrific shot of it. 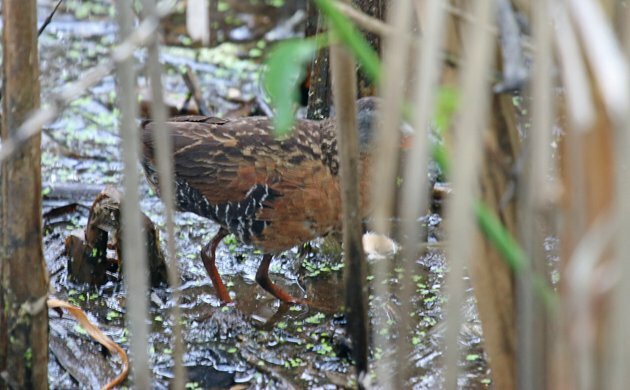 Sure, a birder had reported a cooperative Virginia Rail the day before but I didn’t expect lightening to strike twice! The rail was nice but I was after a different skulking marsh bird and so I climbed into the tower and waited. And waited. And waited. I amused myself by watching the Osprey nest across the pond, by trying to guess which of the two Least Terns fishing the pond would catch a fish first, and by keeping my eyes and ears wide open for sight or sound of Least Bittern. Just as I was lowering my binoculars from watching one of the adult Osprey chase off a Double-crested Cormorant (Why?) 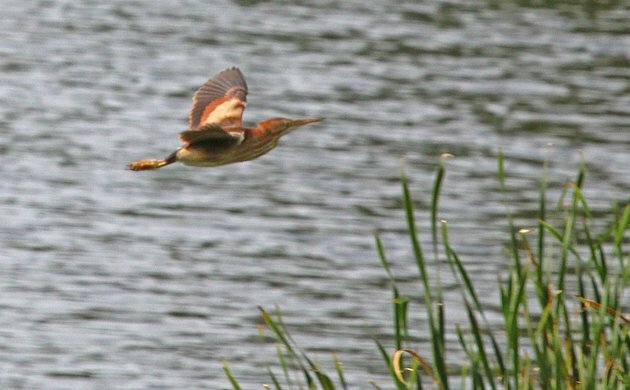 I saw a Least Bittern for about two seconds as it finished a flight from my right to land in the reeds in front of me, completely invisible. It called once, as if to mock me. Then all was silence again. Great, I had seen my Least Bittern almost exactly one hour from when my vigil began but had missed the picture and really, the view had been so brief that I never even got my binoculars up. I decided to wait and see if I would get another look. Fifteen minutes later, as you can probably guess from the picture at the top of this post, a second Least Bittern flew from across the pond, giving a nice long look as it made its way to my right, where the first bittern had flown from, landed in the reeds, and became invisible. But this time I got a couple of flight shots! With that, I packed up my gear and headed out of Arshamomaque Preserve, happy with a successful sighting. 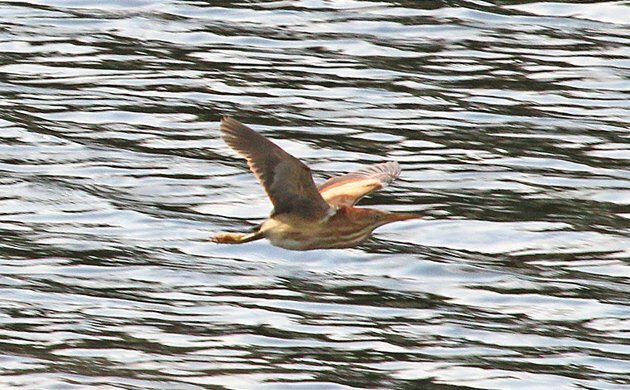 Least Bittern! Whoo-hoo! And, yeah, 22 hours is a looooong shift.